The Happy Homebodies: It's the Thought That Counts. When we saw this mini rocking chair at the thrift store for $3, we thought it would be a cute project to give our niece, Kennadie, who is about to celebrate her first birthday. It started off easily enough. We took the old upholstery off and painted the chair white. Then the husband reinforced the structure with more nails and screws because it was flimsy and wobbly. 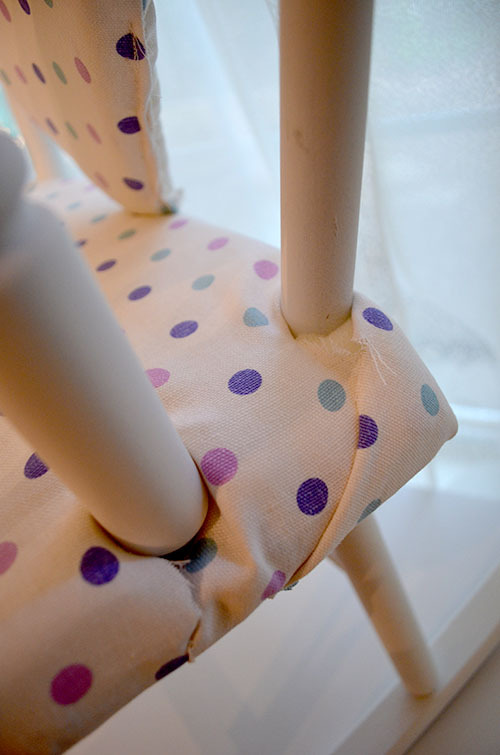 Our niece's chair could not be flimsy or wobbly– simply unacceptable! I know– seamstresses we're not. And the heart shape is lopsided. Awesome. At this point, we were too far in on this project to give up. 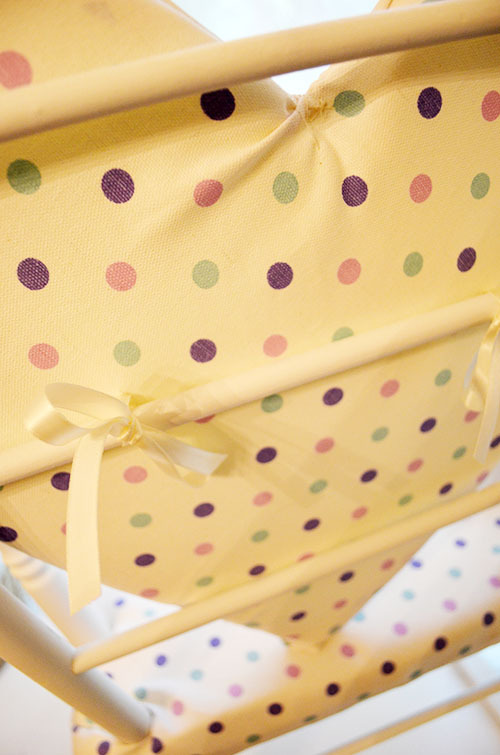 Plus, is a 1-year-old really going to criticize our sewing skills? Her parents may have a good laugh about it, but we figured she wouldn't care too much. We pressed on. 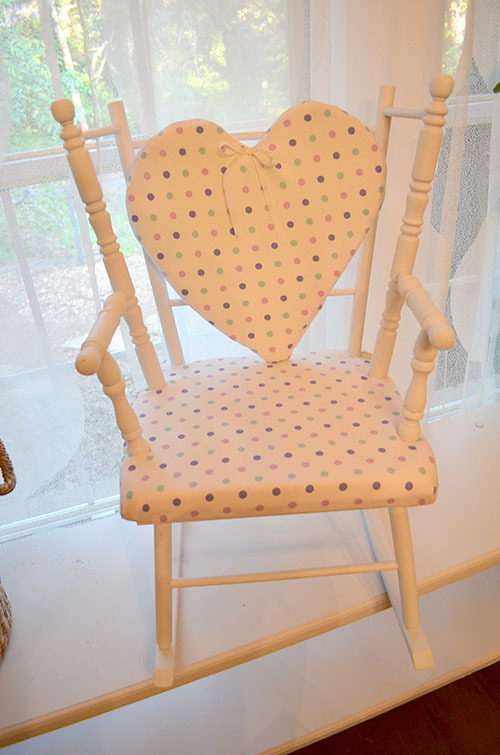 Once the heart was completed, I turned my attention to upholstering the seat. I cut the foam to fit and quickly realized I was in way over my head. Upholstering around all of those crazy spindles made this a very challenging job. I had no idea what I was doing, I promise you. 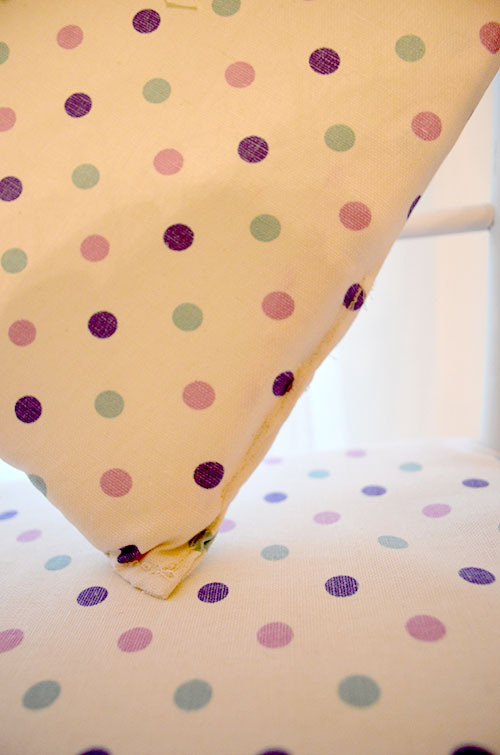 I just started stapling fabric to the underside of the cushion, hoping for the best. This is how your handiwork turns out when you simply "hope for the best." It's embarrassingly bad! If you look closely, you can literally see some of my upholstery foam showing around that back spindle. I was so frustrated, but I had no idea how to fix it! Like I said, I was in over my head. So why do I share this terrible DIY effort with you? 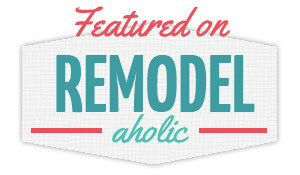 Because I want this blog to be honest, and we are honestly very bad at upholstery and sewing! I could sit here and not show you any detail shots, making you think we did a perfect job on this project. That would be deceiving. Sometimes we bite off more than we can chew and have to face our own DIY limitations. Sewing = disaster. Lesson learned! The good news is that the husband and I were laughing at ourselves the entire time we worked on this project. You win some, you lose some. 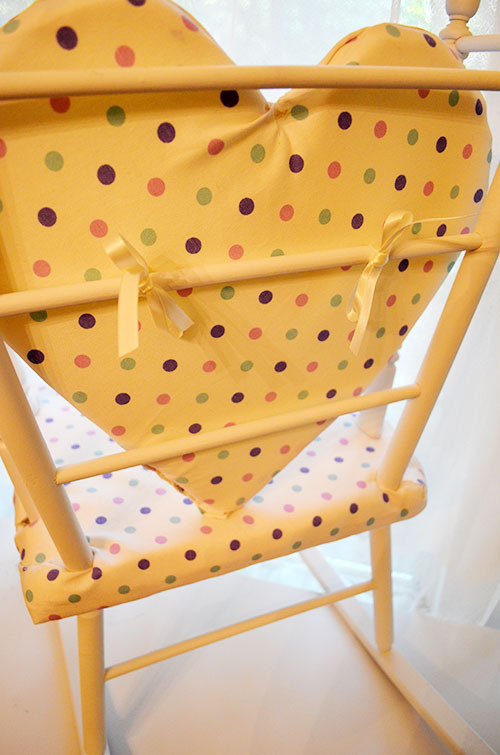 Little Kennadie, I hope you know this chair was made for you with lots of love– not skill. Because it's the thought that counts, right?! Remind me not to upholster any more chairs with six spindle holes, OK?